Brendan the Voyager starts life near the sea, on the Kilfenora side of Tralee Bay in 486AD. On the night of his birth, the local bishop, Eric, sees signs in the sky, signifying the importance of the event. He experiences it as "an attendance of angels in shining white garments all round that land". He tells the happy parents of the child, Findlug of Alltraighe Caille and Cara, who decide to christen their son 'Broen-finn', meaning 'fair drop'. As an infant, Brendan is fostered by Saint Ita, and instructed in the scriptures by Bishop Erc. Brendan is ordained a priest by Erc in 512. Over the course of the next eighteen years, he established monastic foundations at Ardfert, and at Shanakeel on the Dingle peninsula. From an early age, Brendan hears his calling by God, and is inspired by the Gospel passage which promises a rich reward to those who forsake everything: "Whoever leaves father and mother and sister and lands for my sake will receive a hundred fold in the present and will possess everlasting life." An encounter with a holy man called Barinthus proves to be a pivotal point in Brendan's life. Barinthus tells him of a journey, which he and his son Mernoc made to an island called the Land of the Saints. In this heavenly place, they had no bodily needs and no sense of the passage of time. Deep calls to deep, and the story resonates in Brendan's soul. Enchanted by the possibility of attaining such closeness to the divine, Brendan tells fourteen of his monastic brethren that he wants to find the Land of the Saints. In a dream, an angel comes to him, saying, "Arise Brendan, that which thou hast requested, thou shalt receive of God, that is to visit the Land of Promise". Brendan walks by himself to the mountain, which comes to be known as Cnoc Bhréanainn, from which he looks westwards to ocean for the place he longs to find. As he succumbs to sleep, the angel comes to him again with a promise: "Henceforth, I will ever be with thee, and I will show thee that one day, the fair island which thou hast seen and which thou desirest to find." The spiritual fulfilment, which Brendan craves, is never easily attained. He knows that he will have to go to extremes, away from his people and all that he knows, to the very edge of the world. There will be suffering and sacrifice. With his faith affirmed, Brendan sails to Enda of Aran, remaining three days on the island. After this, the brethren start making preparations for their forthcoming journey. As they sail off into the ocean, Enda, Pupa and Ronad come to see them off. As a journey, it is as much a spiritual odyssey as a physical expedition, lasting an exhausting five years. During this time, Brendan and his crew encounter mixed fortunes. As an experience, it is in turn, hostile and inviting. Testing conditions take their toll on the crew, both physically and mentally, and casualties occur. Along the way, there is a fortuitous meeting with a man known as the Procurator. He acts an advocate, comforter and guide to Brendan, someone to encourage him in his radical endeavours. Journeying outwards into an uncertain world, Brendan is also travelling inwards, discovering his self. It is a voyage on which he needs moral support. Bit by bit, Brendan and his crew come closer to their goal. During their time at sea, the monks hold firm to their monastic rule, strictly observing the Church calendar. As far away as they are, they remain connected to the rhythm and discipline of the monasteries on terra firma. After five years, Brendan and his crew return to a tumultuous reception in the west of Ireland. Brendan is a celebrated personality, an inspiration to those he comes into contact with. 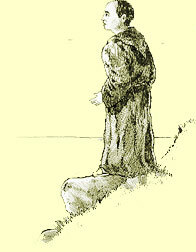 He awakens in many the call to religious life. Brendan visits Bishop Erc and his foster mother, Ita. The latter is annoyed that Brendan didn't come to her for advice prior to his voyage. When she sets eyes on what he sailed in, she loses no time in telling Brendan that it isn't suitable for his purpose. He is promptly given instructions for the assembly of a larger, sturdier craft. And so, for his second journey - for he has not yet achieved his heart's desire - Brendan goes to sea in a boat that is better equipped, and also better manned. His inspirational powers have caught the imagination of such worldly men as shipwrights and smithies who have begged to come along. This is a fortunate development, as this second spell at sea is every bit as taxing and dangerous as the first. Between the creatures of the deep and the birds of the air, this is an incident-packed two years for the sailors, illustrating all the perils and bounty of nature. It is a fantastic voyage. Finally, Brendan comes to his Land of Promise, the heavenly state so long desired. It is remembered afterwards as a "region of Paradise, where will be found health without sickness, pleasure without contention, attendance of angels, meadows in scent as fair blessed flowers". Blissful indeed, but not intended as a permanent resting place for one on this side of eternity. Having thus tasted nirvana, Brendan knows he must return to land and complete his mission in the world. His first stop-off on his return is at Aran, where Enda and Pupa are overjoyed to receive him and his crew. Brendan and company stay here a month, recovering from their time at sea, before sailing down to Inis da Droma near Limerick. Back on land, Brendan dedicates himself to the foundation of monasteries. He travels to Britain, establishing religious houses in parts of Scotland Wales. Returning home once more, he founds monasteries in Clare and Mayo, at Ardfert in Kerry, and most famously, at Clonfert in Galway, in 577AD. Brendan decides on Clonfert as his resting place. After a long and busy life, Brendan dies at the age of ninety-three, in Annaghdown, at the monastic site, which he founded for his sister Bríg. 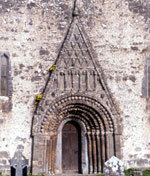 Before he expires, he blesses his sister and his brethren, and asks them to transport his mortal remains to Clonfert. There are many places which would vie for the honour of his body and relics, and Brendan wants to rest where he belongs.